Mount Adams is the second highest mountain in the White Mountains at 5,774 feet. The rocky narrow summit is located between Jefferson and Madison, there are also several sub-peaks of Adams (JQ Adams, Sam Adams, Abigail Adams & V). 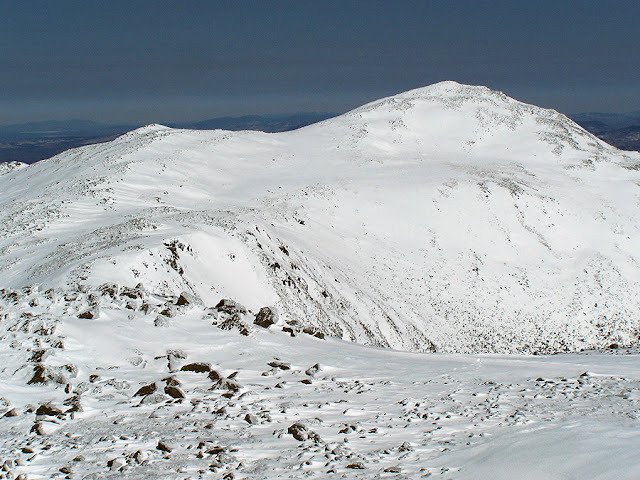 The summit cone of Adams and all the trails leading up to its peaks are above treeline and exposed to any harsh weather that comes through, sometimes with very little warning. The views from Mount Adams summit are spectacular, and as far a the 48 - 4,000 footers go, few if any beat if for views. There are several ways to approach the summit of Mount Adams from Appalachia thanks to the RMC (Randolph Mountaineering Club). The shortest mileage to the summit is via the Airline Trail, although there several trails that come up the ravines to a rallying point at 'Thunderstorm Junction' which is marked by a huge cairn where many trails intersect. From the Great Gulf side the Buttress and Madison Gulf trails go up to Star Lake, located a few hundred feet from Madison Spring Hut. From here the summit can be accessed via the Star Lake Trail. There used to be a trail up the Adams Slide that was extremely steep and attacked Adams directly from the east off the Buttress Trail near the Six Husbands trail junction. This trail was abandoned in the late 1960's, the slide itself is completely overgrown but the old path can still be followed by experienced off trail hikers. -Airline: 4.3 miles, 4,500 feet elevation gain. Airline is the most direct route to the summit of Mount Adams with moderate to steep grades and rough footing. It climbs up over the Durand Ridge on a knife's edge with fantastic views into the King Ravine. The last 1.3 miles are above treeline and can be extremely unpleasant and difficult in bad weather. -King Ravine Trail: 4.6 miles, 4,500 feet elevation gain (via Airline and Short Line). The King Ravine Trail is one of the wildest and most beautiful trails in all of the White Mountains. It's very steep, has pretty awful footing, and can be impassable in bad weather. The views while in the ravine are spectacular and one of a kind as the trail passes through, under, and over boulder caves on the 'Subway' and 'Ice Caves' loop paths which are options that branch off the trail proper. The climb up the headwall of the ravine up through "The Gateway" is extremely short (in length only) and steep 0.6 miles with an elevation gain over 1,300 feet! -Great Gully Trail: 4.5 miles, 4,500 feet elevation gain (via Airline, Short Line, King Ravine, Lowe's Path). The Great Gully Trail branches off from the King Ravine Trail a few hundred yards past where the Subway and Elevated rejoin. It is a very lightly used and steep trail ascending 1,700 feet in just 1.0 miles. Footing is rough and rugged and the trail is very narrow at times. The trail has incredible views down into the King Ravine and across and up to Durand Ridge (Where the Airline traverses the ridge) as you ascend. The main attraction of the trail is an overhanging rock on a ledge with an outcropping rock where there is a sheer drop of hundreds of feet! Experienced hikers will find this fun as it is a 'lemon squeezer' in-between the ledge and overhanging rock where bulkier packs may have to be removed. Adams Slide Trail: 6.3 miles, 4,600 feet elevation gain (via Great Gulf and Six Husbands Trail). CAUTION: The Adams Slide Trail has been abandoned for over forty years since the 1960's. The slide is fully overgrown and the trail should only be attempted by experienced hikers who are comfortable with tough and steep bushwhacks. The Adams Slide Trail AKA the 'Beast of the East' is a defunct trail that continues strait up where the Buttress Trail takes a sharp right across an open talus field. In just 1.25 miles it ascends 2,400 feet and was considered to be the steepest trail in all of the White Mountains. The abandoned trail can be followed with care as there are still red blazes on rocks here and there. Once above treeline the trail continues up the open south eastern slope of Mount Adams with incredible views into Jefferson Ravine and the Great Gulf Wilderness. -Comments: While not as high as Mount Washington, Mount Adams packs just as much punch because of some of the longer approaches and elevation gain from the west and no direct approaches from the east. Views from Adams small-sharp-jagged summit into the Great Gulf up to Jefferson, Clay and Washington are incredible!